Where should the Sette Giugno monument be placed? Where should the Sette Giugno monument be? Originally in St George's square, the monument languished in storage for some time before being moved to Valletta's Hastings garden in 2010, where it remains to this date. But the government is now asking the public to suggest where it should be permanently placed. The public consultation was announced by Infrastructure Minister Joe Mizzi at a press conference today. Mr Mizzi argued that, given the historical importance of the Sette Giugno uprising, the monument ought to be given prominence within Valletta. 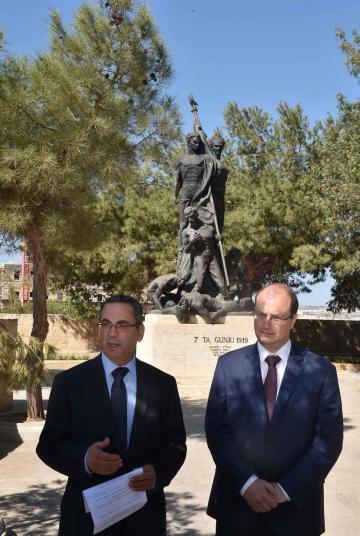 Mr Mizzi said it was a pity that embellishment works of St George's square had not included plans to return to the statue to its original site. He noted that a plan to place the monument alongside the new parliament building had been opposed by some quarters. The public seemed inclined to return the monument to its original location, or else to have it placed in front of the old Valletta market on Merchants' street, the minister said. The public consultation will go on for the next six weeks. Anyone keen to share their suggestions with the GHRC should email ghrc@gov.mt or send a letter to Monument Sette Giugno, GHRC, Triq Antonio Maurizio Valperga, Floriana.